Kickboxing fans in Myanmar are pinning high hopes on Tun Tun Min, the toughest fighter in the country’s traditional boxing ring. This December he will fight for the title in the national championship of traditional Lethwei, considered by many as one of the world’s most brutal martial arts. 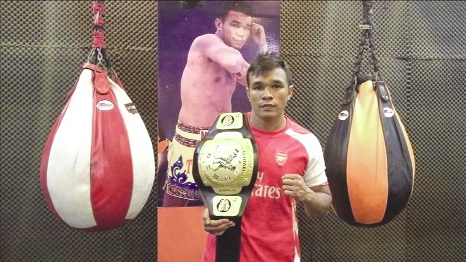 Tun Tun Min, an ethnic Mon and Muslim, became Myanmar’s youngest open-weight champion of Lethwei in 2014. He was only 21. The eldest son of a poor Muslim family in a remote village of southern Mon state, he worked to help his father feed the family instead of going to school. “My father was also a Lethwei fighter, but had no chance to become a first-class fighter. That’s why he’s been training me since I was 6 years old,” said 26-year-old Tun Tun Min during a training session at his gym in Yangon. “I am very interested in Lethwei since my childhood and know it will help us to escape from poverty,” he said. At the age of 14 he was sent off to Thailand to work on a pineapple plantation for two years. He practised Lethweei in his free time. “A Thai owner noticed me and asked me if I would dare to fight Myai Thai boys in the village,” he recalled. He defeated two Thai boys who were considered the best in the village. But the owner did not allow him to join the fight. When he returned to Myanmar, he fought for prize money in Lethwei fights in pagoda festivals and other religious feasts. He won his first gold medal at regional and state sports competition in 2010, and then second gold medal at 27th SEA games in 2013, where athletes from 10 Southeast Asian countries participated. Until late 2016, he had lost only twice in more than 50 matches and been dubbed Lethwei Knockout King. He defended his Golden belt in several challenge fights with both local and foreign fighters. But then he lost his belt to Dave Leduc, a Canadian fighter, in their second match for a double championship title fight in December 2016. Their first fight in October 2016 had ended in a draw. He dominated the fight in Yangon until he got a knee injury when Leduc caught his overextended leg and flipped him to the floor during the third round. He called a two-minute time-out to be examined by his trainer and returned to the ring visibly shaken. After the fight resumed, he soon gave up. “I tried to continue the fight, but I wasn’t even able to stand on the floor,” said Tun Tun Min. Three months later, he returned to the ring and finished the fight with Nicholas Carter, a British kickboxer, during the first round. In his second match in July, with Myai Thai top fighter Saiyok Pumpanmuang that ended in a draw, he again showed a dominant performance. “I am very happy to see him return to the ring with very good performance,” said Ohne Kyaw who had taken a four-hour bus trip to Yangon to enjoy the matches. “His punches are quick. He used head-butts, and his knee strikes are so powerful,” he told Anadolu Agency by phone from his hometown Pathien, about 180 kilometers (112 miles) west of Yangon. “I think now he’s ready (to fight with Leduc),” he said. However, in these two matches, fans were not happy over the absence of his trademark powerful kicks. Tun Tun Min, who said has been preparing for two months for the fight with Leduc, admitted that his knee injury has not fully recovered. “I avoided using my legs in these two fights because my knee was in pain,” he told Anadolu Agency. “But it’s almost fully recovered,” he said. The two fighters signed a contract in October for their third fight, which Leduc claimed will be the biggest fight in Myanmar traditional Lethwei history. “I would prefer fighting foreign fighters to show the true power of Lethwei against other martial arts,” he said on his Facebook page. The fight is scheduled to take place in Yangon on Dec. 16. Tun Tun Min said Leduc, unlike other foreign opponents, is smart and strong enough to stand against the brutality of traditional Lethwei, which even allows head-butts in addition to fighting without gloves. “He’s taller than me and knows how to use his strength,” he said. He accepted that he continues to face discrimination in Myanmar for belonging to the minority Muslim community amid rising nationalism in the country. “Some people are racist and rude. I understand if they support my opponents, but it’s heartbreaking to hear them shout discriminatory words against me,” he said, admitting he had even considered leaving the sport altogether. But he changed his mind, assuming his patriotic duty of taking the Lethwei crown from a foreign fighter. “That’s why I’m going to fight Dave. I will fight with patriotic spirit,” he said.